The first documented account of cholera appears in an Indian medical report of 1563, but the disease seems to have been restricted to Bengal until the 19th century, when unprecedented population growth and increased mobility facilitated its transmission across the world. The expansion of global trade, rapid urbanization and extensive military campaigns ill contributed to a series of six devastating pandemics that killed millions of people. An outbreak in Calcutta in 1816 led to the first pandemic. Carried by pilgrims and troops across the subcontinent, by 1820 it was being transmitted along trade routes: eastwards into China, Japan and the Philippines, westwards to the Persian Gulf, and northwards through central Asia to the borders of Russia. Europe was spared – just. Almost as soon as the first pandemic had receded, a second one started in 1829. This time it took hold in Russia, from where it rapidly spread through Europe. Paris and London were stricken in 1832, with thousands dying in both cities. Emigrants carried the infection across the Atlantic to New York, and by 1834 it had spread to the west coast, southwards into Latin America and north to Canada. London was again badly affected by the third pandemic of 1852-1863, ‘the most terrible outbreak of cholera which ever occurred in the kingdom’. In Soho people were dropping like flies when Dr. John Snow tracked the source of infection to a public water pump that was being contaminated by a nearby cesspit. Through his use of statistics and spot maps, Dr. Snow single-handedly founded the science of epidemiology. The pandemics of 1863-1875 and 1881-1896 again hit Europe hard, but by the time of the sixth pandemic of 1899-1923, when mortalities ran to 800,000 in India and 500,000 in Russia, most of Europe escaped relatively unscathed because of improved sanitation. Death toll: Millions. 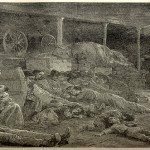 Between 1817 and 1860 there were 15 million deaths in India alone, in Britain, 55,000 deaths were recorded in the outbreak of 1832 while an 1848 epidemic killed 52,000. Between 1847 and 1861 more than two-and-a-half million Russians contracted the disease and over a million died. You should know: Cholera is spread through contaminated food and water. Prevention is straightforward – strict public health measures and decent sanitation. The vibria cholerae bacterium, of which there are at least 16 different strains, causes extremely painful muscular spasms in the intestines with diarrhea and vomiting of such severity that the victim often dies of dehydration within 24 hours. At present the world is suffering from a seventh pandemic. It started in Indonesia In 1961 and shows no signs of receding, in many parts of the world cholera is now endemic.